WOW. Amazing. That is all I can say! The sandwich is so stuffed and so artfully cut and designed. The curves of cheese and the veggies and meats near the middle are so tantalizing. Even at night! Like you in the menu I would have picked the same veggies to go along with the sandwich :). It looks amazing. There is also a Which Wich in San Diego which I haven't tried yet and now you've convinced me to save all my calories for "The Wicked." As for Big Bang Theory, I second the Emmy! Dang this place could give Banh Mi Che Cali a run for it's money. Wholly sandwich looks more like a burrito. The lusting of an over filled sandwich is my kind of eat, most definitely. This is someone who takes pride in his craft. wow, Next week I have jury duty in Santa Ana. Now, I'm looking forward to it! "I am an Asian (I paid for it, damn it). and you included a note on the big bang theory..which is one of my favorite shows too! smart dialogue, great show. It is a craft. And oh.my.god. I think I'm in love with whoever crafted that beautiful, jaw-dropping monstrosity that you ordered. To say I am ridiculously impressed and now YEARNING to try this place would not be overstating things. AI love sandwiches. A whoooole lot. And I almost never pay for them because I know I can make them better at home. But this weekend, I am THERE. I was going to check them out soon after they opened but then I did something stupid and read the initial reviews on Yelp and decided I would get to it when I get to it. Now seeing your review restores hope in my checking them out. I might just have to do it tonight... If I convince my wife that the bread has better qualities then that of Togo's I just might be able to pass this suggestion off! Especially since out bank is right there and I know we need to make a ton of deposits for our business! Anyway um... That thing looks good and you need to remember to mention Togo's as much as you mention Subway and Quiznos, since the order of good chain sandwich places goes; 1. Togo's, 2. Quiznos, 3. All others, 4. Subway. I'm not a big sandwhich kind of guy...well except for a Pastrami Dip at the Hat...but man, that sandwich sure looked good. I need to try it when I get back from my business trip in foodie desert Bedford, MA. Tried this while on vacation in Carslbad the kids, the husband and I loved it. We also LOVE the BBT and hope that 'sheldon' wins an emmy. I'm glad you mentioned the veggies: because what I found out is that they use red bell pepper instead of green, which is always better! Per Kirk's comment below (he is, as you may already know, the uber SD food blogger), his experience with Which Wich in SD wasn't as good as mine. So there may, perhaps, be some variance in quality. And BBT! I actually went to the taping for the first episode of next season. I won't reveal any spoilers here though. But I can say, it's going to be a classic! Banh Mi Che Cali is unbeatable in price, but I can't live on cheap banh mi alone! Speaking of which: I was going to tell you and others that if you look at the coupon book you get in the mail (if you live in Tustin/Irvine), there is a Buy One Sandwich Get One Free offer, valid for Happy Hour and weekends. Why didn't I think of that! It *DOES* look like a burrito! A true statement. Though my sandwich maker was probably female! Warning: It's quite a schlep from Downtown Santa Ana though. Santa Ana's a huge city! If you're serving at the Federal Building, Tommy Pastrami is excellent! HAH! I'm proud of that joke too, even if it propagates the (true) stereotype. I complete missed your review of it until now. My dining companion, brekkie_fan, got the SPAM sandwich and it was okay. The difference was that her wheat bread was not like my white bread...softer and not as crusty. BBT is great isn't it? It's dialogue is so smart, it's hard to quote! I was both surprised and quite proud of myself when I got the joke on the Heisenberg Principle. Be sure to check your local coupon books for a BOGO offer. It's valid on the weekends! And also, I didn't mention it in the review, but I noticed that the wheat bread is softer, a more standard loaf. If you like banh mi, and I know you do, try the white! I am repeating myself now, but be sure to look for a coupon in local coupon books they send in the mail. 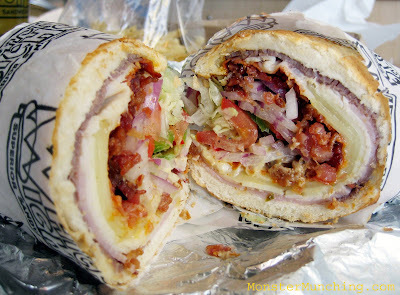 Which Wich has got one in there! Funny enough, I've never tried Togo's! 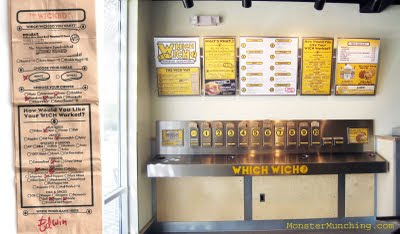 It would be appropriate if there were a Which Wich in Massachusetts, the state of the Salem Witch trials, if purely for the pun! I'm rooting for Jim Parsons too. He's cracked me up since that FedEx commercial where he plays the lazy son. Interesting factoid related to Quiznos, since we're talking sandwiches: that's Jim Parsons in this Quiznos ad. Haha...red bell peppers also cost more than green bell peppers at my supermarket! Which is also why red bell peppers are better :). Interestingly my word verification is "eationy". Tried the wicked at Wich yesterday. Absolutely awful. First off the taste was so salty from the bacon you couldn't taste anything else. The biggest problem was it took 20 mins to make it and it wasn't even busy. Never again! So I went there last night and got a Wicked with a bunch of stuff on it and it was great! Price is good for the size, and it had just the right amount of everything. Sandwich was ready in less then 10 minutes. Review to follow on my site. I'm still drooling. Why doesn't a sandwich taste good at home when made with better quality ingredients versus a a shop? Ate here based on Elmo's recomendation. It was awesome. I had the super meat 3 cheese thing. Meaty tangy, spicy. Really good sandwich! That sandwich looks delicious! I don't usually crave sandwiches, but I would try that one. But I don't do Suckway or Jimmy John's or Quiznos...A sandwich really has to be something for me to eat it. Thanks again for sharing! I think you may have (finally) broken my unfortunate sandwich adolescence. How weird, it's like the word verification knows!! And yep, that's what I said when I saw the red bell peppers: nice touch, cuz those ain't cheap! Aw. Well that's no good. 20 minutes is longer than I waited for my last Kogi burrito! So I can understand why you wouldn't be happy with that. It took us less than 5 minutes to get our sandwich. And I believe there were three people ahead of us. Good thing too. My lunch hour is exactly that: an hour. I've got some suggestions! I like your project! Quite sneaky, yet genius! Waiting to hear what you have to say about it! And also your pictures! I want to see if they are consistent in the artistry that they demonstrated in my sandwich! You got me! If I could make this sandwich at home, I would...except the problem is that I'd end up with too many ingredients that would just sit around when I run out of the other ingredients. It's like the hot dog and bun conundrum. Well there ya go folks! Which Wich gets a DD stamp of approval! There was a full house at noon when we were there last Friday. I guess it may be an end-of-the-week treat for most? Now Pot Belly is a chain I'd welcome, if just for the name! But funny enough I tried Jimmy Johns when I was in Wichita. I can't remember if I liked it, only that it was slightly better than Subway, which at the time, was good enough. Because, again, I was in Wichita. Actually, I believe this was probably the first "American" sub-type sandwich I've had in place like this in a while. I've consumed almost exclusively banh mis for the past few months. You know, because of the recession and all. *wink*. holy eff, that is one good lookin sandwich. i thought this place sounded familiar after seeing your link to kirk's post. the way of ordering is pretty cool, and i think it's a pretty fair price too. By the looks of the different sandwiches we got, it seems we are luckier to have a better Which Wich here in OC than in SD. At least for now! I'm happy to see that Which Wich has made its way to socal! I had one of those sandwiches in Austin and was won over IMMEDIATELY. Why has it taken this long for American sandwiches to be a worthwhile meal?